filt = design(D,'Systemobject',true) uses the filter specifications object D to generate a filter System object™, filt. When you do not provide a design method as an input argument, design uses the default design method. Use designmethods(D,'default') to see the default design method for your filter specifications object. For more information on filter design specifications, see Design a Filter in Fdesign — Process Overview. filt = design(D,METHOD,'Systemobject',true) uses the design method specified by METHOD. METHOD must be one of the options returned by designmethods. Use designmethods(D,'default') to determine which algorithm is used by default. To help you design filters more quickly, the input argument METHOD accepts a variety of special keywords that force design to behave in different ways. The following table presents the keywords you can use for METHOD and how design responds to the keyword. Forces design to produce an FIR filter. When no FIR design method exists for object D, design returns an error. Forces design to produce an IIR filter. When no IIR design method exists for object D, design returns an error. Produces filters from every applicable FIR design method for the specifications in D, one filter for each design method. As a result, design returns multiple filters in the output object. Produces filters from every applicable IIR design method for the specifications in D, one filter for each design method. As a result, design returns multiple filters in the output object. Designs filters using all applicable design methods for the specifications object D. As a result, design returns multiple filters, one for each design method. design uses the design methods in the order that designmethods(D,'Systemobject',true) returns them. filt = design(D,METHOD,PARAM1,VALUE1,PARAM2,VALUE2,...,'Systemobject',true) specifies design-method options. Use help(D,METHOD) for complete information on which design-method-specific options are available. You can also use designopts(D,METHOD) for a less-detailed listing of the design-method-specific options. filt = design(D,METHOD,OPTS,'Systemobject',true) specifies design-method options using the structure OPTS. OPTS is usually obtained from designopts and then specified as an input to design. Use help(D,METHOD) for more information on optional inputs. If you are specifying design-method-specific options using OPTS, you can also set OPTS.SystemObject to true instead of calling design with the 'SystemObject', true syntax. Design an FIR equiripple lowpass filter. Specify a passband edge frequency of 0.2π rad/sample and a stopband edge frequency of 0.25π rad/sample. Set the passband ripple to 0.5 dB and the stopband attenuation to 40 dB. Use the default equiripple method. 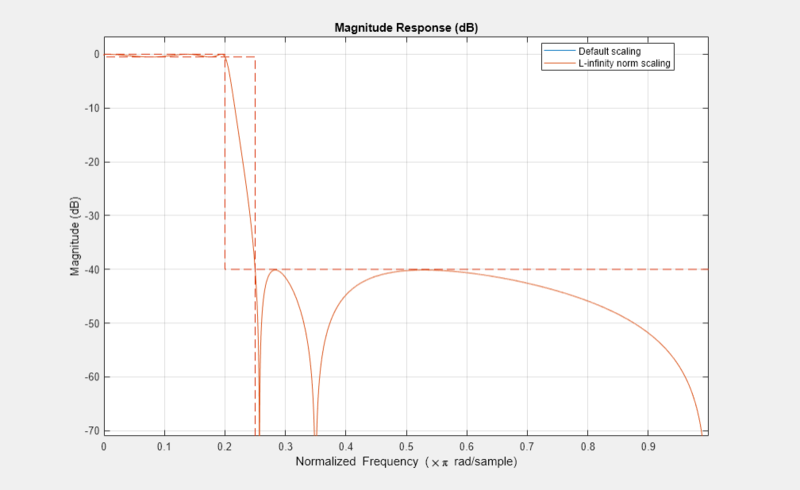 Design a minimum-phase FIR equiripple filter. 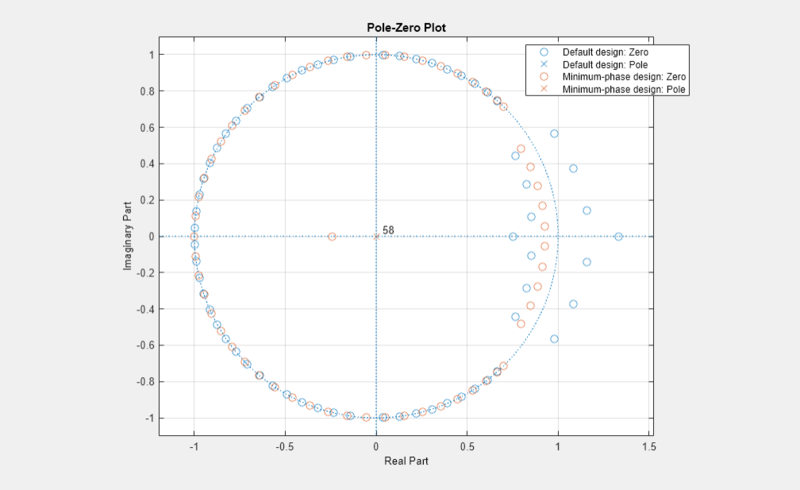 Display pole-zero plots of the default and minimum-phase designs. Redesign the filter using the elliptic method. Match the passband exactly. You can specify the P-th norm scaling on the second-order sections. Use L-infinity norm scaling in the time domain. Display the frequency responses of the Butterworth filters.